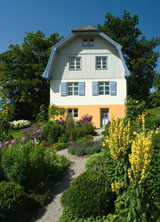 Gabriele Münter purchased the house on the Kottmüllerallee in Murnau on August 21, 1909. From then until 1914, Gabriele Münter (1877-1962) and Wassily Kandinsky (1866-1944) frequently stayed in the house popularly known as the Russenhaus (“House of the Russian”). They furnished it together, laid out the garden, and decorated their furniture with their own painted designs. The countryside around Murnau, but especially the house itself, the garden, and the immediate surroundings, were an important source of inspiration for Münter and Kandinsky. They often painted the window views of the church, the castle, or the mountains. It was through his interest in the landscape that Kandinsky’s painting developed toward abstraction. The Münter House also played a formative role in the history of the Blue Rider. It became an important meeting place of the avant-garde. Franz Marc, who lived in nearby Sindelsdorf, Alexej von Jawlensky, Marianne von Werefkin, August Macke, and Arnold Schönberg were frequent visitors, as well as collectors and gallerists. Working meetings preparatory to the publication of The Blue Rider Almanach took place here in October 1911. Besides Münter and Kandinsky, Franz and Maria Marc and August and Elisabeth Macke were involved. When the First World War broke out in 1914, Münter and Kandinsky first fled to Switzerland, since Kandinsky, being Russian, was now considered one of the enemy. He returned to Moscow in November 1914, where he was to remain until 1921. Gabriele Münter lived in Sweden from summer 1915 until December 1917, finally settling in Copenhagen. At the start of 1920, Münter returned to Germany. 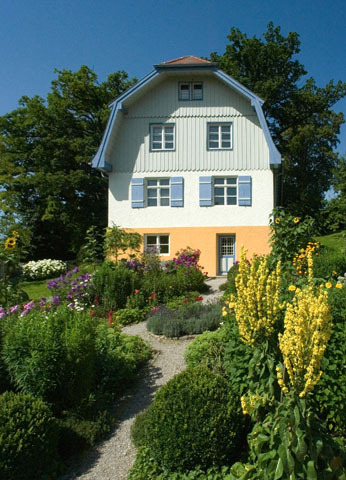 From 1931 until her death in 1962, the painter lived in the house in Murnau again, from 1936 on together with her later partner, the art historian Johannes Eichner (1886-1958). In the basement of the house, she safeguarded an inestimable treasury of paintings, mainly by Wassily Kandinsky, but also works of her own and by other major Blue Rider proponents and those of the broader circle, thus rescuing them in the era of National Socialism. On the occasion of her 80th birthday, Gabriele Münter donated important parts of this unique collection to the Städtische Galerie im Lenbachhaus in Munich. Since its restoration in the years 1998/99, and in accordance with the artist’s wishes, the entire Münter House was set up as a site commemorating her art and that of Kandinsky and opened to the public. It was restored to its original condition of the period 1909 to 1914. Richly furnished with paintings, prints, and reverse glass paintings by Kandinsky and Münter, with folk art they collected and items of furniture they painted, the house today conveys a lively impression of the atmosphere here before the First World War. In May 2014 a new museum guide for the Münter House was published. In addition to the already known history of the house, it describes other aspects of Münter’s and Kandinsky’s life in Murnau. There is a chapter dedicated to the garden that Kandinsky designed and laid out with such enthusiasm. The Münter House was not only a site of artistic creation but also a place where important personalities interested in the art of the Blue Rider came together — this side of the house is also examined. 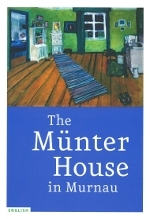 A further chapter looks at Münter’s life in the house after 1931, the year in which she took up fulltime residence there (8 €, ISBN 978-3-9815164-1-8). Open daily (except Mondays) from 2 p.m. to 5 p.m. The House is open on all holidays (except Dec. 24 and 31), even if the holiday is a Monday. The Münter House offers no parking space. An hourly rail service connects Munich and Murnau. Guided tours can only be arranged in the mornings, outside opening hours. The Münter House is administered by the Gabriele Münter- und Johannes Eichner-Stiftung, Munich.